We are sitting in a small restaurant in Ontario, California, next door to her organization on a sunny afternoon. It’s a place that she referenced because of her love for their tacos and tostadas and how often the students from her organization frequent the location. “They have really good food here, and me and my students love it,” she says as she fixes her long brown locs. One of her employees joined us for lunch and gave her a few notes about her day while co-signing that this was, in fact, one of the best places to eat in Greater L.A.’s Inland Empire. Dr. Torie Weiston-Serdan is late to the meeting because of a scheduling conflict — something that happens regularly because of the many different hats she wears. You can hear a small amount of frustration in her voice. But it’s not being busy that has her stressed — for being busy isn’t anything unusual for her. For Weiston-Serdan, 36, a full-time educator and founder of the Youth Mentoring Action Network (YMAN), the feeling comes from knowing that she could do so much more if she had the funding to hire additional support staff to help run her program. In its 12 years, the Youth Mentoring Action Network has centered much of its focus on helping youth deal with various life lessons. Weiston-Serdan makes it known that she is dedicated to meeting the needs of underserved black, brown, and queer youth populations. 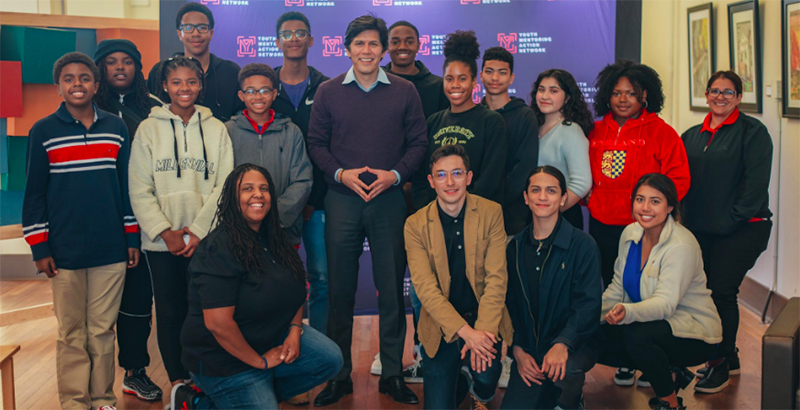 The program focuses on engaging and collaborating directly with youth and giving them a voice in helping to solve the problems they face — whether related to academics or identity development. The program, inspired by Weiston-Serdan’s dissertation and book, Critical Mentoring: A Practical Guide, hopes to redefine practice around how people in the field think and do mentoring work. “I am different, so the way I do my work will always represent that,” Weiston-Serdan says, referring to being a black queer woman working in a space that is often dominated by black heterosexual men. In the book, she brings an intersectional approach to the idea of mentoring, looking at the ways that oppression keeps marginalized youth from going to college or finding full-time work. Her research and work focus on the idea that mentoring shouldn’t just be based on gender identity but also about ways of meeting youth where they are so that they can have a better understanding of who they are and where they are trying to go. One of the most important things she believes in doing that work is visibility. Although being a black queer woman dedicated to mentoring has been difficult due to a history of being marginalized, her work with the National LGBTQ Advisory Council and the California Mentoring Partnership Research Committee points to the need for more queer women to be engaged in this work. Her organization serves more than 500 middle and high school students directly, but it is estimated that it assists more than 6,000 youth and adults from the programs, services, and events that YMAN offers. Much of the outreach she does begins with her work as a local educator for Rancho Cucamonga, a city of about 177,000 in the foothills of the San Gabriel Mountains, and her engagement with local activists from her hometown of Claremont. Her connection to Pitzer College in Claremont also serves her well, allowing her to actively engage the youth she serves with other college students who, like her, are trying to make a change in their local community. The program, research, and community engagement have brought her great joy, yet she recognizes that her struggle to keep it going isn’t by happenstance. Weiston-Serdan, who sees this as a common occurrence for black women doing mentoring work, admits that she can barely keep going because she doesn’t have the funding she needs to support young people in the ways she wants. “A lot of the work comes directly out of my own pocket,” she says. When asked why she thinks she’s not getting more community and fiscal support, she speaks of the misogynoir and patriarchy that often live in the shadows of critical mentoring work. Complicating her financial challenges, Weiston-Serdan says, is that most mainstream or large, long-established philanthropic organizations are run by men, who, based on her experience, rarely understand the needs of programs that focus on gender, race, and sexuality. “There aren’t that many women doing this work. There aren’t as many queer black women being allowed to do this work because space isn’t being created for us to do it,” she says, cutting her critique with a warm and inviting laugh. For Weiston-Serdan, funding is only one of the many hills her mentoring work faces. She talks about seeing much of her research co-opted with little to no credit. Full erasure of her voice and work is something she often has to confront in educational spaces, she says. “Once, I learned that there was a group that created a guide using my concepts from my book and dubbed it ‘MEN-toring,’” she says. Weiston-Serdan sees black women continuing to get a bad name in mentoring work while doing much of the emotional and mental heavy lifting, noting that she often feels really alone in her field mentoring marginalized youth. It’s deeper than that, Weiston-Serdan says. Jonathan Higgins is a speaker, writer, and social justice advocate whose work focuses on issues that affect both the black and LGBTQ communities. He has lectured at numerous universities, including William and Mary and the University of Oregon, on topics related to intersectionality, race, gender, and sexuality. Jonathan Higgins is a speaker, writer, and social justice advocate whose work focuses on issues that affect both the black and LGBTQ communities. Higgins has lectured at numerous universities, including William and Mary and the University of Oregon, on topics related to intersectionality, race, gender, and sexuality.